C76 POWER ACE V-BELT. 80" Length, 7/8" Top width. Industrial grade Classical V-Belt. 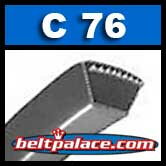 C76 POWER ACE (HI-POWER II) V-BELT. 80" x 7/8". C76 POWER ACE V-BELT. 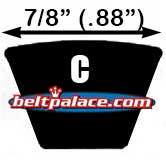 80" Length O.C., 7/8" (0.88") Top width. Industrial grade Classical V-Belt.